Angela Fuller Heyde joined the Dallas Symphony Orchestra as Principal Second Violin in 2009. An advocate of new music and chamber music, Ms. Heyde leads the ensemble at the Bancroft Family Concert on January 27, 2018. Ms. Heyde and FACP Artistic Director Rogene Russell settled on the idea to stage Franz Schubert’s “Trout,” and the concert program was crafted by adding Duo by Alan Hovhannes to the afternoon. This piece for violin and cello has special significance to the violinist: the work was commissioned by Ms. Heyde’s father for her mother. Tell us: what is about “The Trout” that made you want to put an ensemble together? This has always been a favorite of mine. I grew up watching a VHS recording (remember VHS?!) of Itzhak Perlman, Pinchas Zukerman, Jacqueline du Pré, Zubin Mehta, and Daniel Barenboim performing “The Trout.” The joy and interplay amongst that group of friends was inspiring – and of course the playing was, too! 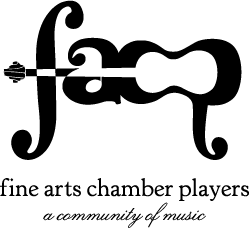 Why was a Fine Arts Chamber Player concert the place to perform the piece? We felt that the FACP audience would love to hear this favorite. You started playing violin at age 3, with your mother as your teacher. Why did you choose the violin? How long did you study with your mother, and what was it like transitioning to a different teacher? I chose the violin because that was my mom’s instrument and I wanted to be like her! I studied with her until I was 9. She basically had to drag me to another teacher, I was so afraid of the change. The teacher she brought me to, Sally O’Reilly, was and continues to be a second mom to me, her wit and warmth made the transition manageable. What type of music did you listen to as a kid, and what do you listen to now? As a kid I tried hard to listen to the music my friends listened to (all I can remember at the moment is ’80s Madonna), but in my heart I knew I loved classical music, and that’s what we listened to at home. Now I generally prefer quiet, or in the car I listen to NPR or an audio book. I listen to stuff my husband listens to: U2, Coldplay. I like that a lot but don’t necessarily seek it out myself. Different sections of the orchestra have different roles. Can you explain what the second violin section’s focus is? The role of the second violins is that of backup singers. The first violins are Beyonce, and we are the backup singers. We support, harmonize, and often do the same things as the first violins at an octave lower to fill out the sound. Sometimes we provide more of a rhythmic current, while they get to sing away at the melody. It can be very interesting and rich, though sometimes I would rather be playing the first violin part! Who’s your favorite composer to listen to? To play? It is very hard to name a favorite. I love Beethoven: I think his violin concerto is absolutely perfect. I love Shostakovich, and I love Brahms. Brahms is very satisfying to play. As a second violinist I always appreciate Bruckner. He really used the second violins as equals, giving us a lot of incredible material to dig into. What advice would you give 14-year-old Angela? I would tell 14-year-old Angela to have a little more fun and practice a little less. I was so serious and so focused, I feel like I missed out on normal kid stuff. On the other hand, I might not have gotten to this place in my career! What advice would you give a high schooler who wants to pursue music in college? I would tell them to make sure that they are with a great teacher, and make sure that they find a great teacher for college, not just to go to a school with a fancy name. I would tell them to practice well, but live a little, too! What’s your favorite sound (musical or non-musical), and your least favorite sound (musical or non-musical)? My favorite sound is my 2-year-old’s voice when she says, “Hi, Mama.” Least favorite sound is the sound of people chewing. Arg! New Year. New Logo. Same Mission.